Just a quick post this week for those interested in writing and publishing. 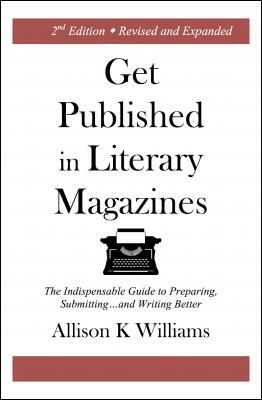 I discovered, Allison K. Williams’ book Get Published in Literary Magazines: The Indispensable Guide to Preparing, Submitting…and Writing Better through the Brevity magazine’s blog last week. It looked great, so I ordered it and promptly devoured the book this week—reading in every spare moment. It’s a short, quick read, but Williams’ shares a ton of valuable information about the submission process, what editors think, and how to grow in your writing. If your goal is to publish what you write and you are somewhat new to the process, I definitely recommend this book. Thanks for taking the time to post a review – I really appreciate it, and I’m so pleased you enjoyed the book. Happy writing! Thank you, Allison! I’m a fan of your work.